Welfare were in front on three minutes when Liam Radford hit home a firm low drive from the edge of the box, but Hallam equalised after 18 minutes as Mitch Husband hooked a shot over his shoulder. Two minutes later Hallam had the lead, Kieran Watson scoring with a low angled drive, and the visitors shot themselves in the foot again on the half hour mark as the Countrymen went 3-1 up. Josh Bucknall was robbed by Watson just outside the area and although Adam Stevens made a fine save in the visiting goal, Ben Thornton was on hand to tuck away the rebound. Armthorpe were back in the game just before the interval when Tom Wilson conceded a needless penalty, bringing down Luke Williams close to the byline and although Archie Sneath made a good save from Radford’s spot kick, Williams was quickest to reacting to tuck away the rebound. Hallam restored the two-goal cushion on the hour, Watson tucking away his 11th goal of the season. The points were wrapped up on on 75 minutes when Thornton turned in from close range. Penistone Church remain second in the Premier Division following an excellent 1-0 win at third-placed Knaresborough Town, The only goal arriving in the 13th minute from Nathan Keightley. “For me it was so far the result of the season,” said a delighted Penistone boss Ian Richards. “To come away to a team like Knaresborough, a team that walked the Division One last year and are not used to losing at home, was a great result and the lads deserve a lot of credit. A depleted Handsworth Parramore came away from Maltby Main with a good point from a 1-1 draw. The Miners hit the front on 16 minutes when Jordan Turner was upended in the area leaving the experienced Danny Frost to put away the resultant penalty. The Ambers though were level just nine minutes later, Lee Cooksey powering home a header from a Jake Currie cross..
Worksop Town rescued a point with a stoppage time equaliser against Barton Town as it ended 2-2 at Sandy Lane, while Staveley MW took their unbeaten run to three games with a 2-2 draw at Hall Road Rangers. 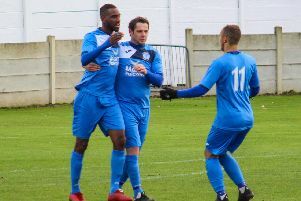 Athersley Recreation picked up a good point on the road with a goalless draw at seventh-placed Hemsworth MW while, after losing the last four outings, Dronfield Town returned to winning ways after coming from behind to beat nine man Shirebrook Town 2-1 at Stonelow Road. Swallownest came from 2-0 down at home to beat Harworth Colliery 4-3 and Worsbrough Bridge Athletic made it back-to back league victory for the first time since the end of August with a late 1-0 win at neighbours Parkgate. Kieran Hirst slammed the ball home from close range four minutes from time against his former club to earn the Briggers a seventh away win of the season. FC Bolsover crashed to a 16th straight league defeat, losing 4-1 at home against Selby Town where Jake Morrison hit a late consolation goal. In the Evo-Stik league, Stocksbridge Park Steels slipped to a narrow 2-1 defeat at leaders Morpeth Town. David Carson shot through a crowded area to give the home side a fourth minute lead and Jeff Anderson doubled the advantage on 17 minutes, before the hosts were reduced to ten-men when Sam Hodgson was shown a straight red card for an awful two-footed challenge on Tom Charlesworth. Steels looked to make their numerical advantage count particularly in the second half with Brodie Litchfield, Scott Ruthven and George Grayson forcing the keeper into good saves. 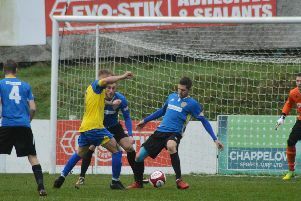 Stocksbridge finally got one back three minutes from time with Luke Mangham scoring with a well placed shot under the keeper - but it wasn’t enough to earn a point their performance had merited. Fixtures, Tuesday: Sheffield Senior Cup third round: Harworth Colliery v Hallam, Stocksbridge PS v Maltby Main. NCE League Cup Third Round: Swallownest v Goole AFC. WEDNESDAY, Sheffield Senior Cup Third Round: Athersley Rec v Renishaw Rangers, Dodworth MW v Staveley MW. Toolstation NCEL Division One: Worsbrough BA v Shirebrook Town.